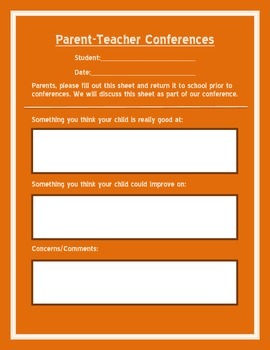 This conference form is one that I send home with each of my students before every conference. I use this because rather than me telling the parents what his/or her child is excelling/struggling with, it gives the parents the opportunity to tell me how they think their child is doing. I always find it interesting to see if parents are on the same page as me :) I always request that it be sent back prior to conferences, so that I have a chance to look over and prepare for each family.